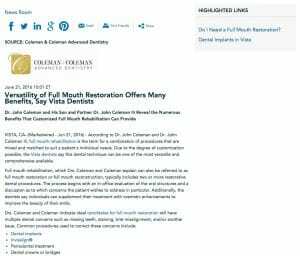 Dr. John Coleman and his son and partner Dr. John Coleman III reveal the numerous benefits that customized full mouth rehabilitation can provide. Vista, CA — According to Dr. John Coleman and Dr. John Coleman III, full mouth rehabilitation is the term for a combination of procedures that are mixed and matched to suit a patient’s individual needs. Due to the degree of customization possible, the Vista dentists say this dental technique can be one of the most versatile and comprehensive available. Full mouth rehabilitation, which Drs. Coleman and Coleman explain can also be referred to as full mouth restoration or full mouth reconstruction, typically includes two or more restorative dental procedures. The process begins with an in-office evaluation of the oral structures and a discussion as to which concerns the patient wishes to address in particular. Additionally, the dentists say individuals can supplement their treatment with cosmetic enhancements to improve the beauty of their smile. 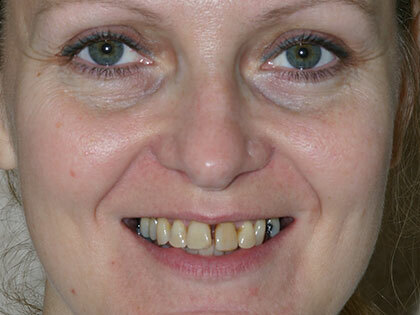 Full mouth reconstruction can address simple, complex, and moderate cases, and Drs. Coleman and Coleman wish to emphasize that there is typically no concern (or number of concerns) too big or too small, as each procedure is fully individualized. Since the treatment plan will vary from person to person, the dentists suggest patients might wish to speak with a dental professional experienced in full mouth rehabilitation to develop a better idea of what to expect from the process. The founder of Coleman & Coleman Advanced Dentistry, Dr. John Coleman works alongside his son to serve patients in the Vista, Oceanside, and North San Diego County area. 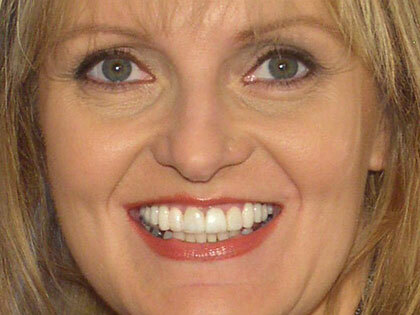 A graduate of the University of California, Irvine and Georgetown University, Dr. Coleman is extensively trained in dental implantology, reconstructive dentistry, and orthodontics. He has been recognized as one of the Top 1 percent of dentists practicing in the country by the Academy of Cosmetic Dentistry, and he has served as a past President of the Academy of Cosmetic Dentistry’s Southwest Chapter. Dr. Coleman is available for interview upon request. Dr. John Coleman III, the son of Dr. John Coleman, earned his undergraduate degree from the University of California, San Diego and his Doctor of Dental Surgery degree from New York University. He has completed extensive training in temporomandibular joint disorder (TMD) and he is state certified to perform oral conscious sedation. In the process of becoming a Fellow of the Academy of General Dentistry, Dr. Coleman III is also an active member of the American Dental Association, the California Dental Association, and the San Diego County Dental Association. Dr. Coleman III is available for interview upon request. For more information about Drs. Coleman and Coleman and their practice, please visit sandiegocosmeticdental.com and facebook.com/colemandentistry.